Town Village Audubon Park had a lot of older people. The rooms were nice. The person showing me around knew what he was doing. They had an indoor swimming pool and a walking trail. The dining area seemed spacious and clean. Town Village Audubon Park was really pretty but looked kind of tired. The people were lovely. The rooms were very small, but the unit I saw was nice. The dining area looked tired, too. I had lunch ther,e and it was fine. They certainly seemed like they were on top of things. The residents looked happy, and the staff seemed very nice. Town Village Audubon Park is a wonderful community that provides the essentials to a stress-free; simplistic life. Our apartment – style accommodations, community activities, and dedication to meeting your needs give you the freedom to live as you choose and enjoy the lifestyle you want. Town Village offers 12 different floor plans ranging from 533 square feet to 1,118 square feet. Renovations have been made within the last 2 years, and we pride ourselves in keeping the building in great shape. Feel free to visit www.townvillageaudubonpark.com for our most up-to-date pictures, and of course we always welcome guests to stop by for a visit. We moved to Village Audobon Park into a nice two-bedroom with a living room, kitchen, and two bathrooms. My wife described it as living in a luxury hotel. The food is excellent with a lot of variety and options, and we like it a lot. We like the happy hour on Friday afternoons. I am living in Town Village Audubon Park. I love it. It's wonderful. The staff is excellent and does a great job. They have bingo, Xbox bowling, various field trips, bridge playing and other special things that come up from time to time. They have plenty of things to keep people busy and there's variety. My room is definitely spacious compared to other places I've visited. I'm enjoying it very much; it's exactly what I need. I live in Town Village, and it's absolutely wonderful. The food is good, the staff is good, and everything is right here. They have Bridge, Canasta, Dominos, movies, jewelry making, lawn dancing, and Sudoko. They have a menu chat where you talk to the chef about your food. The botanical gardens and the art gallery are just right across the street. They take bus trips to museums, casinos, tours, and shopping. My mom is at Town Village Audubon Park. She has a room with a separate bedroom, bathroom, and a full kitchen. Seh has a laundry facility in her room. The room where my mom live is not only larger, but very nicely appointed. They have tables where they can play cards and dominos. They also have a nice fireplace so people can sit there. They also have a very large dining area. The quality of the food there is good, and mom is quite satisfied. One big advantage with where she is now is it's much less expensive compared to the other places we've seen. Town Village is very nice, upscale, and seem to have everything that one would want in independent living. The staff was very nice, and called me back several times to see if I was interested. Town Village Audubon Park was right the same as the first one that I’ve seen. The staff was friendly, it was very neat and clean, and the entrance was beautiful. The rooms were spacious, and I liked their floor plans. They had plenty of activities. I just moved in Town Village Audubon Park. The staff has been excellent and the amenities are great. They bring in housekeeping. They also take us to places where we need to go. I would say that the food is excellent as well. They have bingo and movies as part of their activities. The rooms and apartments are smaller than I was used to but it was fine. Town Village is very nice, clean, and neat. The people are all very kind. The rooms were very large, and the kitchen was nice and neat. It had everything I needed. Town Village was wonderful. The staff was very professional and very friendly. We did a walking tour of all the facilities including the pool area, the card room, the billiards hall, the movie theater, and many of the apartments. We had a very nice visit there; it was very thorough, and all of our questions were answered. I settled here in Town Village, and it has been very good. They are very kind. They help you, talk to you, and introduce themselves. My room is nice. It is small, but I just moved out of a big house; I'll get used to it. The food is great. All the meals are very nicely done. They have activities like bingo and trips to town, and they will take you to doctors' appointments and shopping. Town Village Audubon Park was a lovely place and we enjoyed our visit there. The facility was very clean and pretty. The apartments were airy, bright and clean with a kitchen and all the amenities. Even pets were allowed in the apartments. We ate lunch and the food was really good. If you had special needs or special diets, they accommodated that as well. The staff were amenable and attentive, and the other residents were also friendly. There was an activity room but we were not able to witness any activities. Dining Extra: Three Meals Per Month Can Be Delivered At No Charge And A $5 Fee Per Delivery After That. Town Village Senior Living goes beyond senior housing. We strive to provide a distinctive lifestyle filled with friendships, endless activities, and exceptional attention to detail. From all day restaurant-style dining to life enriching activities, we offer a wealth of thoughtfully designed services and amenities included in your monthly rent. Relax in the lounge , or join us in the bustling Town Square. Take one of the many classes offered in our fitness center, or take a dip in our heated indoor pool and whirlpool. Grab a book from our library, or pick up last-minute needs at our convenience store. Step outside and discover peaceful outdoor spaces for strolling the grounds, visiting with friends or gardening in our resident gardens. Our spacious grounds boast several courtyards, walking paths, and outdoor seating to enjoy some fresh air and bird watching. Great location, all inclusive resort-style dining 7am-7pm, pantry 24/7, Brunch every Sunday, Bistro with Bar, salon, pool, spa, fitness center, secured parking. 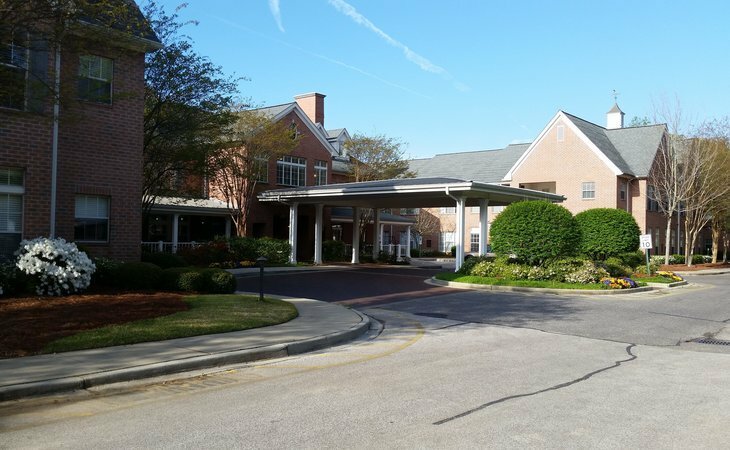 What should caregivers and potential residents know about Town Village Audubon Park?